Refreshing your home with some fresh paint is always a great idea. Changing up the colours in your home can have a tremendous effect on the overall feel of a house. And it doesn’t matter if you are going to paint the whole room or just an add some accent to a wall. Doing some paint job around your house is a sure way to upgrade your interior design without breaking the bank. If you think about it, this might be the cheapest way. So, with this in mind, we are here to share a couple of tips and tricks on how to make painting fun and easy. At least a bit. Before starting to do any painting work whatsoever you should prepare both yourself and the room. It’s always a great idea to invest in some gear. Get some eye protection. Protective goggles are inexpensive, and they will save you a tonne of headaches during the process. Especially if it involves painting a ceiling. You’ll have to always look up and when gravity does its thing, you’ll end up with paint in your eyes. After you have chosen the proper clothing and have all protection gear in place, it’s time to prepare the room. If you are going to paint your whole house then make sure to call some help. Getting the area ready for work is a slow and delicate process. 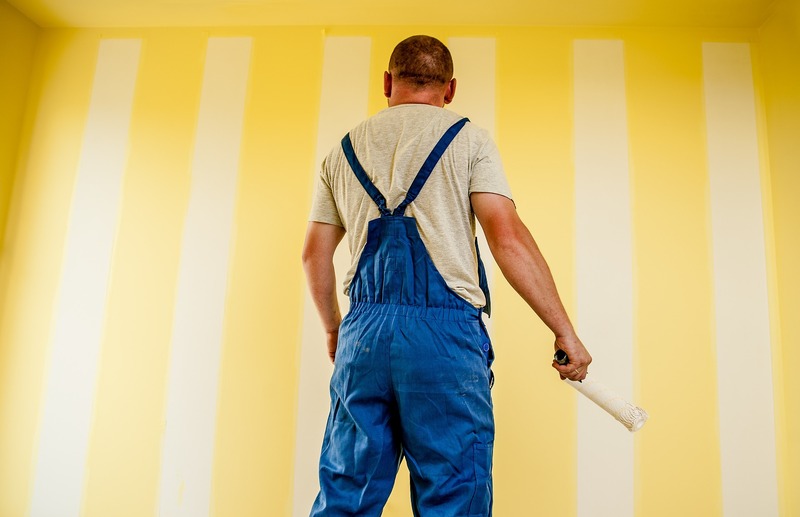 Take your time with sealing any areas properly to avoid getting paint on them. The best way to protect other walls, and anything really that will be in the way of painting, is using masking tape. Get different diameters of masking tape for different areas, as they will do a great job of protecting the things that you want to paint around. Make sure you have enough materials to cover the ground and any furniture that is too big to be moved out of the room. Cloth covers like sheets won’t do any good, because of the absorbent nature of such materials. Most likely they won’t protect anything because the paint will soak through and stain the furniture below. We suggest you stack up on nylon sheets. They are fairly inexpensive and can be found in any hardware store. After you are done with your job ensure you are disposing of the nylon in the proper way. You can recycle it. Make sure to call the proper authorities and ask them how to do it in the most eco-friendly way. Now, you have the safety gear, and you’ve got nylon sheets that cover the furniture that is in the room and also the whole floor. Floors covered in paint would be the last thing that you want after a renovation. Place a big enough sheet of nylon and use scotch or masking tape in places that you decide can be compromised. If you don’t have such big sheets, then tape a few together, it would do the job. If you wouldn’t remove the electrical outlet cover plates, then make sure to mask them good with tape. It would do the job well and it will protect it perfectly. Cut the excess tape with a model knife. Featuring a contrasting wall in your room is great for interior design. It can really make a room feel cosier. In order to do things like a professional, you should really take your time and cut the corners of the room properly. Again with a couple of layers of masking tape mask the edges where the two areas meet. If you have painted the area that you want to mask then wait a day so the paint has time to dry completely. However, it’s better to do the contrast colour wall first. That way even if you paint a bit on the other wall by accident you won’t have to repaint the area. Make sure to cut the corners where the wall meets the ceiling, if you are going to paint with a contrasting colour. Now, that you have sealed and taped all the places that you find necessary, you can proceed with the sealing any holes that you might have from hanging pictures, clocks, or mirrors. Nowadays there are pre-made fillers in a tube. All you have to do is squeeze a bit into the hole and then even out with a putty knife. How to Paint a Room Step by Step. Before you start doing any painting work make sure to cut all angles, corners, around the frame of the door and the electrical outlets. It’s important to prime your brush first. Priming is when you dip the brush in the paint and smudge on an area with it. 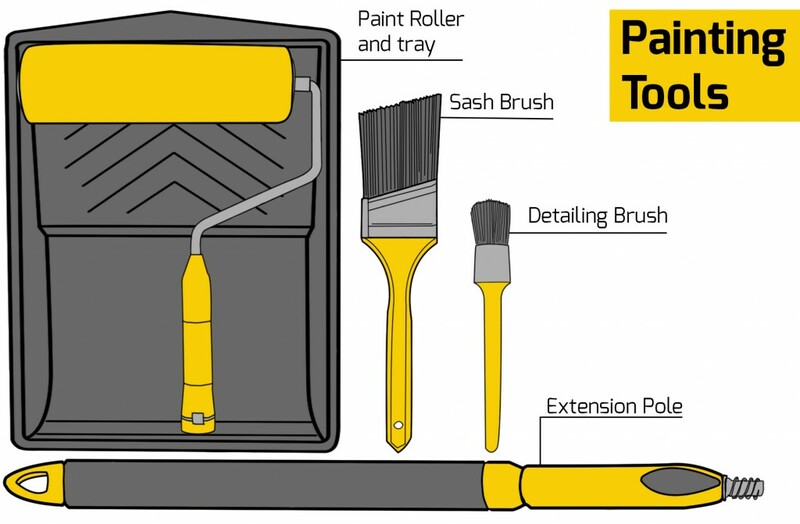 That way you allow the brush to absorb as much paint as it can and the painting will be smoother. If that’s your first time doing this kind of job, then you should know that only one coat isn’t going to be enough. It’s more of a layering process. The first coat should always be the base. Leave fixing the imperfections for the second coat. Wall Painting – What and How to do? Even though the painting itself might be the part that you will enjoy most, this is the step that requires most skill. It’s crucial for the final result how you will paint and what tools you are going to use. All experts will agree that investing a bit more in higher quality brushes and paint rollers is always a good choice. Don’t go with a pack of 3 for a dollar just to save a bit of cash. Go to your local hardware stores and search for the items that will do the job best. Sash brushes seem to be the experts choice. This is the brush with angled bristles at the end. And the bristles made of nylon seem to be the popular pick because they are soft and feathers paint well. The gathering is crucial, but the paint that you are going to use is the most important aspect. Even with the best tools, you can’t achieve good results if the paint is cheap. When choosing the colour and brand make sure to talk with the consultant in the shop. Tell him for which room you are going to use the paint, the colour and the price range that you are in the market for. Make sure to consult with him how to mix your paint properly and write that down just in case. If you do it wrong you can ruin the whole bucket. Read the instructions if you still aren’t sure how to mix the paint. You’ll either have to use water or paint thinner. This depends on the type of paint. It’s best to ask before buying it. At least you’ll save an extra trip to the hardware store. You have protection on, the paint is ready and you have prepared the room. Now it’s time to get your painting technique up to date. We’ve all seen people paint in movies. Sometimes it’s a lovely couple, other times it’s a mid 20’s guy looking like a model. But as most things seen in the movies it should stay there. The way people paint there is usually the wrong way. Yes, it looks great on film but if it’s done in real life you’ll end up with an ugly wall and wasted time. In order to paint the wall correctly, you have to paint in the same direction always. From top to bottom. No sideways and no up-down-up movements. That way you’ll distribute the paint evenly throughout the wall. When the paint dries it will look even. If you don’t follow this rule the end result will be in patches. Some places will have way too much colour and other will have the previous colour showing through. How to Paint a Ceiling – Step by Step Guide. Painting your ceiling requires planning. Here is how you can paint a ceiling, and this step by step process works for any size ceiling. Always cut the corners of the ceiling first. Never leave this for the end. By cutting the ceiling first you ensure that you won’t have to go too close to the walls and you won’t accidentally smudge the wall with paint. When cutting the corners always use lot’s of paint and an angled brush. Make sure to tape the corner of the wall with masking tape for extra protection. Divide the area into smaller segments. Often times the ceiling is too big to be painted with a single row. Separate the area into smaller pieces and work your way. Usually, it’s perfect to be divided into four parts, but you can divide it in as many as you need. Always roll the roller towards the natural source of lighting. If you paint the ceiling in the other direction there’s a chance to see the differences in the coats of paint (if there’s some) once it dries. Overlap your streaks by 50%. When you paint make sure to overlap with the previous roll by no more than half. However, don’t make the mistake of not overlapping enough. After all, you want to have a nicely painted ceiling.